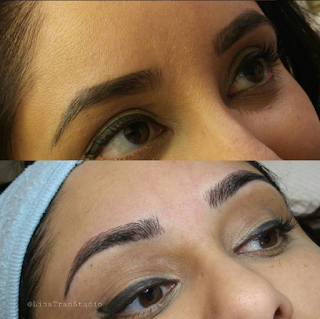 Microblading has been quite popular all over social media. You can find so many amazing Instagram accounts displaying the amazing brow transformations by talented techs (and they are so addictive to watch). So I was tempted... and the search for a skilled microblading tech soon started. I scoured the net and read reviews and finally settled on Lina Tran of Lina Tran Studio in Toronto. She not only does microblading but is also a hairstylist and colourist (will be going to her again for my hair!) During my microblading appointment I had the pleasure of speaking to her as if we were old friends and I found out she's also an artist - no wonder because those hair strokes were amazingly precise and lifelike! So now for anyone who doesn't know anything about microblading let's get into it and I'll post my own pictures as well for you all. So before going into a microblading appointment it's important that you listen and know exactly what you are spending your money on! Let's be honest, the procedure isn't exactly cheap but it is a great alternative for those with very sparse brows or anyone who is sick of filling in their brows ALL THE TIME. This is also great for anyone with misshapen or badly aligned brows who wants to get them symmetrical. So what are some things you should know before walking into your appointment? 1. Make sure you really do your research on the microblading tech. In the age of the internet and with so many reviews all around there isn't really an excuse for not doing your homework. You hear the horror stories all of the time of people complaining of their bad experience... but then you got to wonder - didn't they check it out first or read customer testimonials? That is KEY. 2. Is the price too tempting or way over the top? Yes microblading is definitely an art and is very expensive to fix if done wrong. So why take that chance? If the price is surprisingly low or way over the top - be wary. You shouldn't be going too under or over the $300 - 800 price range for microblading. Techs with more experience will charge a bit more as they will have more clients and a higher demand. However, if any tech is new to the game and is charging an arm and a leg... avoid at all costs! 3. The microblading tech should outline the procedure BEFORE touching your brows. Make sure when you pay your deposit, they tell you the details of the procedure and what you need to do to make sure you get the result you want. In my case, Lina sent over a few pages of information outlining the procedure, as well expectations, what to expect after the procedure and what to do prior to coming in for the appointment. All of this is important since you are investing money and time into this. Otherwise - stick to the brow pencil boo. Before I went into my microblading appointment with Lina, she had sent over instructions on what she needed from me to get the results I wanted. I read through the pages she sent over, some of it outlined the procedure, numbing cream that would be used and also that I was to come in with my brows already filled in. That part did confuse me - but Lina had told me she wanted to see how I wanted my brows to look and that it would give her an idea of the type of look I was going for. Everyone is different in how fierce or filled in they want their brows to look. I personally feel very heavy brows do not look good on my face, so I wanted something natural and just right to fill in those sparse areas. 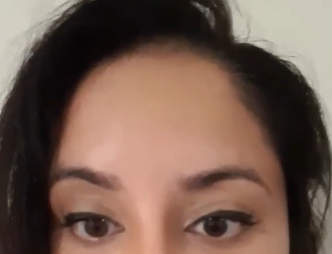 I made a snapchat video for my followers prior to going into my appointment so they had an idea of how my brows looked filled in and without anything. I will post some pictures of my brows before and after the appointment. I'll also post a picture which Lina took (and is also on her Instagram page). 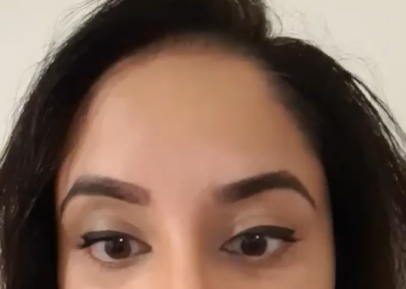 Brows all natural, before microblading and not filled in. Right after appointment. 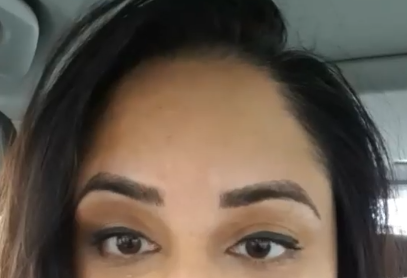 Brows are completely bare. So after about 4-6 weeks you should go in for a touch-up which is usually free and included. Usually this is the time the technician can go back and fill in any areas that might be lacking in pigment and also anything that you want fixed. I won't lie... the touch up did hurt a bit. This was mainly because there were no numbing agents involved this time. Lina had told me that the numbing cream would interfere with the pigment getting absorbed into the skin and so it wouldn't have the desired effect. SO... I put on a brave face and soldiered through. The strokes this time... I could definately feel them and my eyes did tear up a bit. However, if you can get through that 15 - 20 minutes of touch-ups (might be a shorter time if you don't really need much to fill in), then the end result is amazing. I am beyond happy with my results and often times I don't even fill in my brows anymore. Sometimes I will here and there but it's definitely not needed. The best thing of this procedure is that my eyebrows are symmetrical now. So all in all, do I recommend it? Yes - if you are someone looking to get your brows more symmetrical and have areas of sparseness, then go for it! Next post will cover our new lip shades which are set to launch very soon! So stay tuned!